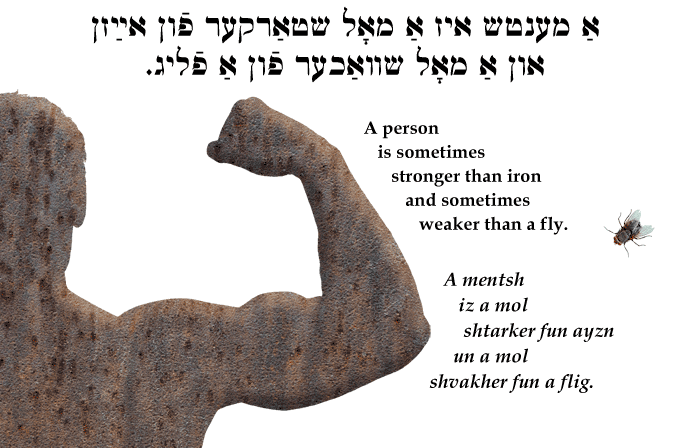 Yiddish Proverb: A person is sometimes stronger than iron and sometimes weaker than a fly. אַ מענטש איז אַ מאָל שטאַרקער פֿון אײַזן און אַ מאָל שוואַכער פֿון אַ פֿליג. A mentsh iz a mol shtarker fun ayzn un a mol shvakher fun a flig. A person is sometimes stronger than iron and sometimes weaker than a fly. A mentsh iz shvakher fun a flig un shtarker fun ayzn. A human is weaker than a fly and stronger than iron.